Note: MelOn no longer supports creating accounts via email and requires a Korean phone number. Note: MelOn no longer supports creating accounts via Kakao email and requires a Korean phone number. This section is no longer valid. Note: Creating an account is similar across all platforms. For the purpose of this tutorial, we will be providing instructions using a mobile browser. Steps will match for the most part. Note: If you’re using a browser, make sure your popup blocker is disabled! Note: If you’re having issues following this section on your app, try the browser. On the phone, go to http://m.app.melon.com/index.htm. Then select ≡ (triple bar). Enter in username and password and then click “Log in”. Note: If you do not have Kakao, you can create one at this point. Click on “전체동의” and then “가입완료”. Tap “멜론 아이디 등록” at the bottom. Enter in desired MelOn ID and click “중복학인” to verify it is not in use. Then enter in desired password and the click “멜론 아이디 등록”. A pop up might appear to confirm your information. Click “확인”. Now you can login with MelOn ID! Note: It is recommended international fans do not post any comments in MelOn. Log in with your Kakao information. Enter in desired MelOn ID and tap “중복학인” to verify it is not in use. Then enter in desired password and the tap “확인”. At the pop up tap “확인”. Change app store by following this tutorial and then download the app here. Click on the gear symbol in the upper right corner. Enter your MelOn account information and select “로그인”. Select ≡ (triple bar) and then click on the gear symbol in the upper right corner. Enter your MelOn account information and select “로그인”. Click “취소” to any pop ups. Note: If you are still logging in with your Kakao email, please make an MelOn account at this time. Enter in desired MelOn ID and click “중복학인” to verify it is not in use. Then enter in desired password and the click “확인” to confirm. Log in with your MelOn ID. Select ≡ (triple bar) and then click on the gear symbol ⚙. Select “카카오 계정 관리 미 연결”. Enter in your password, then tap “확인” to confirm. Tap the “X” in the upper corner to close out. Now you can login with your Kakao ID! If your Kakao email is listed, it is connected to your MelOn account. Note: You can buy a streaming pass (unlimited streaming + no download credits) or a combo pass (unlimited streaming + 30, 50 or 100 download credits). Note: You will have 30 days from day of purchase to use it. Any unused credits will be forfeited after the end date. Please use all your credits before your pass expires! Note: If you have already bought a pass, you can not buy another pass. 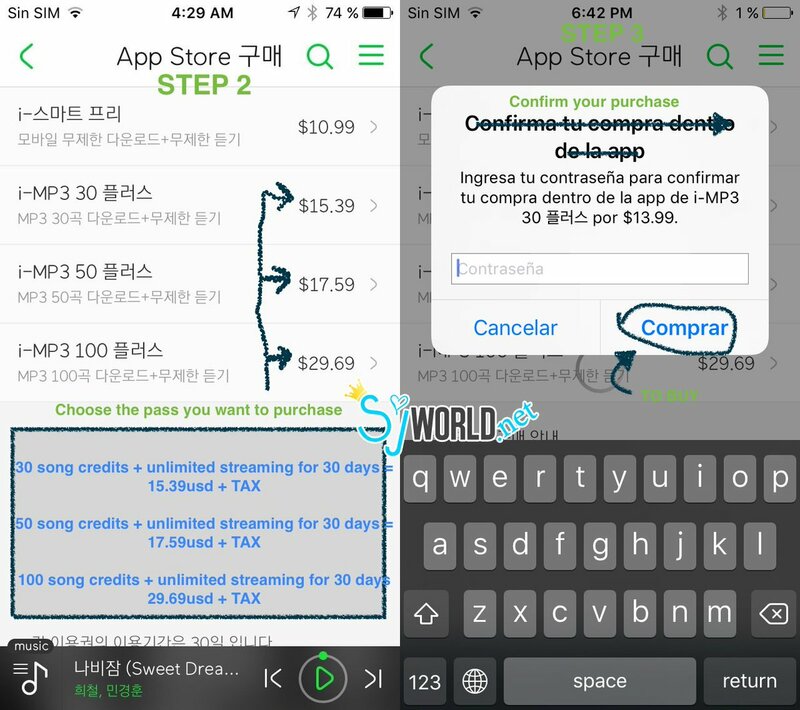 Note: MelOn credits can not be purchased on Android devices or iOS devices with software newer than 4.3. If you’re account is verified then see next section. SJWorld staff has been making purchases for fellow ELF since 2014 and can make the purchase on your behalf. Note: This section is for when you bought or activated a MelOn pass. Select ≡ (triple bar) and you will see your pass in green. Tap on it to see more details. Note: If you can not afford to buy a pass, you can try to win a pass. You could win a streaming 스트리밍 pass (stream any song 30 times + no download credits) or a download 다운로드 pass (no streaming + 30 download credits). Note: You can participate in the event if your account is verified. We can not help with verifying your account or help with purchasing a verified account for you. Note: You can participate in the event only once per account. Any additional attempts will result in an error. Tap this if playing on mobile browser. For this event, scroll down and select between two options. Proceed to the next step and choose again and then submit for a chance to win a pass. If you win, do not activate the pass until it is closer to their comeback. 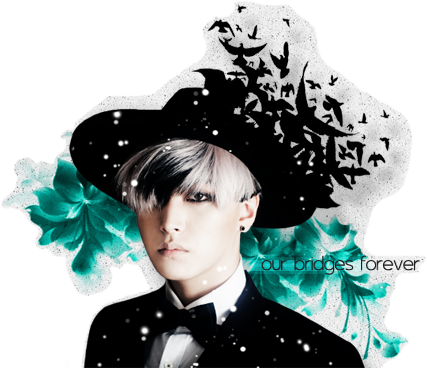 [PC] Click on the event link mentioned by us or other fansites. These events provide you a chance to win a “꽝” or a code or some other random prize. If you receive a “꽝”, sorry sorry, better luck next time! Try on another account. If you receive a code, click “복사” to copy the code. Note: Take a screen shot to ensure you have the code. If you want to add the code on your account, click “쿠폰등록” then click “확인”. If you want to add the code on another account, click “획인”. [PC] Click here. Enter your code and then click “쿠폰등록”. [Mobile] Click here. Enter your code and then click “등록하기”. Select ≡ (triple bar) and then click on “이용권구매”. Enter your code and then click “등록하기”. Note: This section is for when you won a free MelOn pass from a sponsored event. Note: You will have 30 days from day of activation to use it. Any unused credits will be forfeited after the end date. Click on “사용하기” to activate a code. Click on “쿠폰함으로 이동” then click “사용하기” to activate a code. 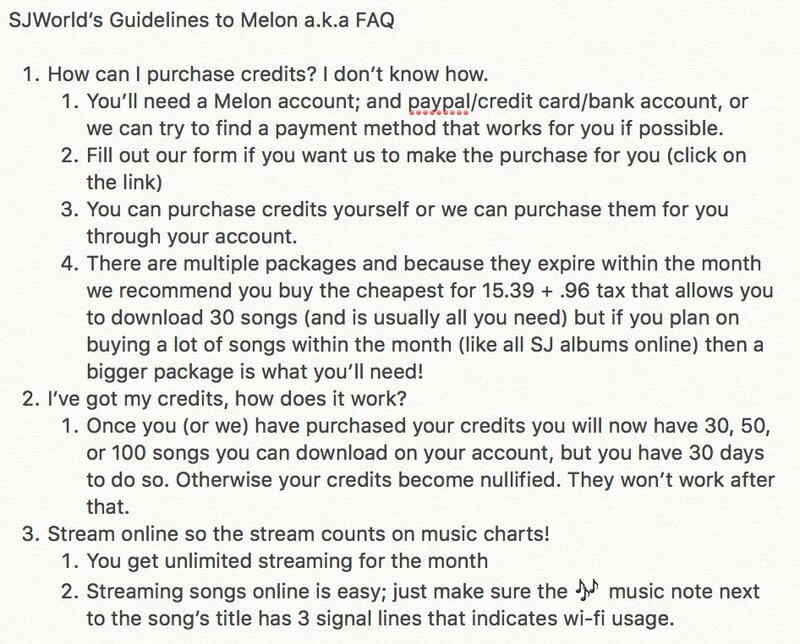 Note: You need a MelOn pass to stream, whether it be a free limited streaming pass or a purchased unlimited pass. If you are listening to each song for one minute, you do not have a pass. Note: Some have said it is best to stream in the last quarter of each hour, others have said second half of the hour. Note: If you have a free limited streaming pass, then ensure you play a song ONLY once in one hour. Playing a song more than once in the hour will waste your limited pass. Note: Some have said when streaming, do not hit pause, rewind or fast forward and let the playlist play from start to end with no interruptions. Note: Stream on your phone or laptop but never together! You can only stream on one platform per MelOn account. Search for Super Junior and navigate to their album page. Tap on “✔ 전체선택” to select all the songs, and then tap on the “+ sign 담기” at the bottom. Note: Don’t forget to “♥ heart” the album and rank it “5 ★ stars”. Tap on the first option “재생 목록에 담기” to add the playlist. Then tap on the “▻ play symbol” to start listening. 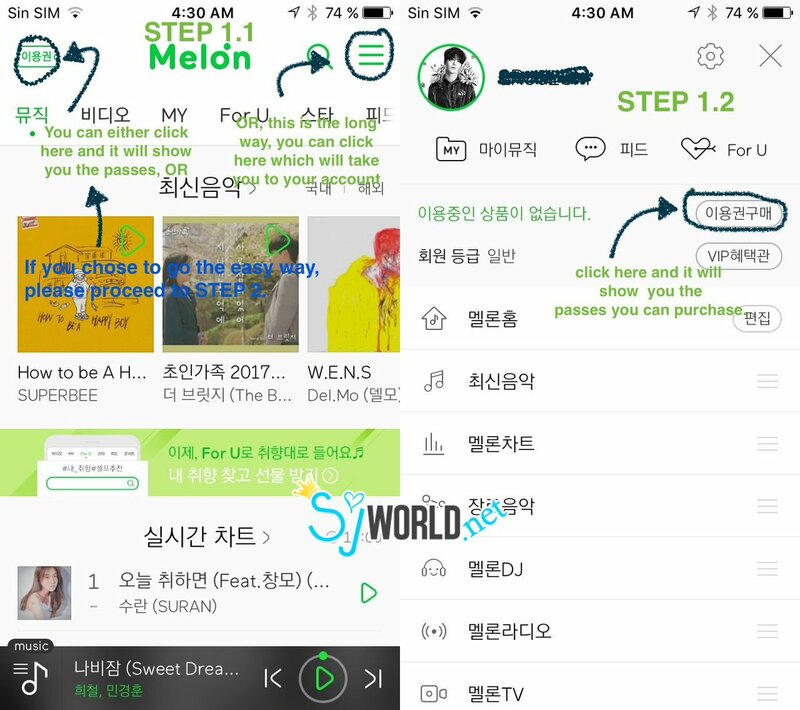 Note: The MelOn app will continuously play the songs even if you use your phone for other things. Tap on the bottom to view the current song playing. Note: Make sure you see a wifi icon on the left of the track. And don’t forget to “♥ heart” each song. Stream online by following this tutorial. Note: You need a MelOn pass with credits to download. Note: You can download the album or any songs from the album more than once using the same MelOn account BUT it will only be counted as one download. Select on the song you want or tap on “✔ 전체선택” to select all the songs, and then tap on the “↓ sign 다운” at the bottom. Select “선택 곡 다운로드” at the bottom, then select “확인” to confirm. Select “신규 등록하기”, then select “확인” to all pop ups. [Android App] Swipe up to see incoming downloads. Note: If you do not see this, try this section again. After you download the songs to your phone, clear your playlist. Note: Even if you download the songs to your phone, listening to them will not count as streaming. Make sure you see a wifi icon on the left of the track. Download by following this tutorial. Note: Some have said that clearing your playlist every hour after listening to all the songs helps in counting your stream. Select the “♪ music note” at the bottom left corner. Select “✔ 전체선택” to select all the songs and then tap the “trash icon 삭제” at the bottom right corner. Note: Some have said to log out of and log back in your MelOn account every midnight KST. Others have said to log out after each hour. Tap “내정보” under your username. From main screen, select ≡ (triple bar) and then click on the gear symbol in the upper right corner. Select “로그인 관리” next to your MelOn ID. Select “로그아웃” to log out and then “확인” to confirm. Note: This section is for when you created your MelOn account with an email address, not Kakao. You will see the email you signed up with here. If you would like to know your name tap “이름 / 나이 확인 / 개명”. If you have a Kakao account connected to your MelOn account, you can unlock your account by logging in through Kakao. If you do not have a Kakao account connected to your MelOn account, you will need to reset your password with your name and email you used to create your MelOn account. Please read the section on how to reset your password. Note: This section is for when you been locked out of your account. Reset your password by following this tutorial. You can join the contest only if you already have a melOn account. We will not make the melOn accounts for you. You can tweet each more than 10 times if you want. The more times you tweet everything, the higher your chances of winning. This is a 24-hour event. You must be done with everything by July 15 midnight KST.